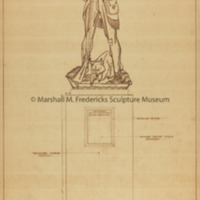 Cutout of "Davy Crockett" photostatic copy possibly for "Pioneers and Early Settlers" for the Ohio Union Building at Ohio State University. 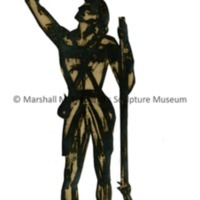 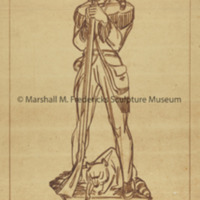 Sketch for one third life size bronze figure of "Davy Crockett"
Sketch for one third life size bronze figure of "Davy Crockett," possibly for "Pioneers and Early Settlers" for the Ohio Union Building at Ohio State University. 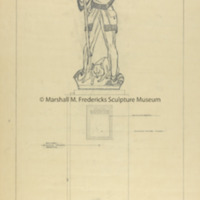 Sepia print of sketch for one third life size bronze figure of "Davy Crockett"
Sepia print of sketch for one third life size bronze figure of "Davy Crockett," possibly for "Pioneers and Early Settlers" for the Ohio Union Building at Ohio State University. 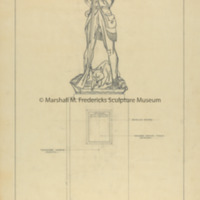 Sepia print of sketch for one third life size "Davy Crockett"
Sepia print of sketch for one third life size "Davy Crockett," possibly for "Pioneers and Early Settlers" for the Ohio Union Building at Ohio State University.